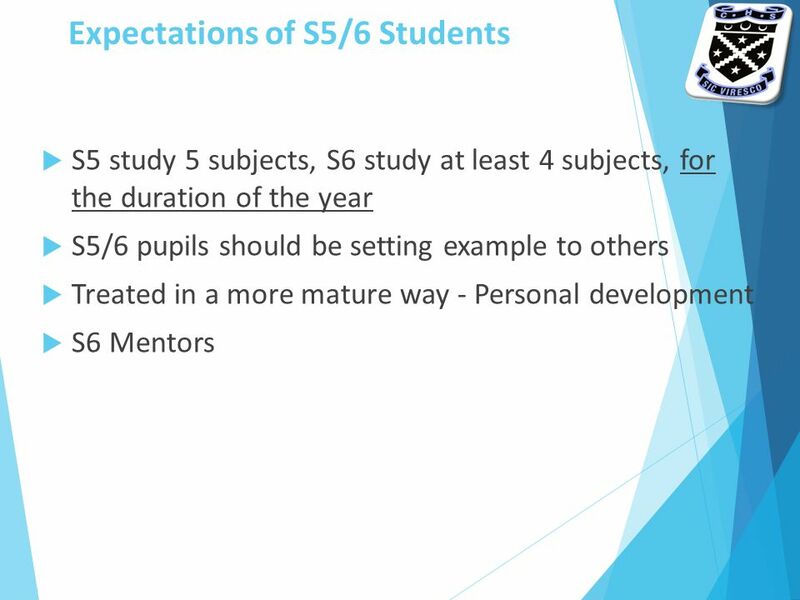 5 The Options Process To Date  In S1/S2, pupils studied up to 16 subjects  In S3/S4, pupils studied 8 subjects  In S5/S6, students will study a maximum of 5 subjects  Subjects offered at different levels. 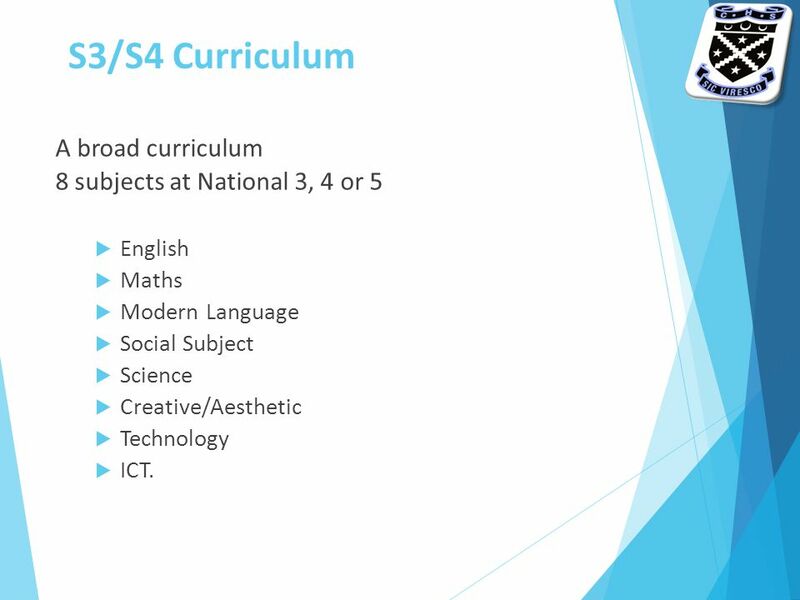 6 S3/S4 Curriculum A broad curriculum 8 subjects at National 3, 4 or 5  English  Maths  Modern Language  Social Subject  Science  Creative/Aesthetic  Technology  ICT. 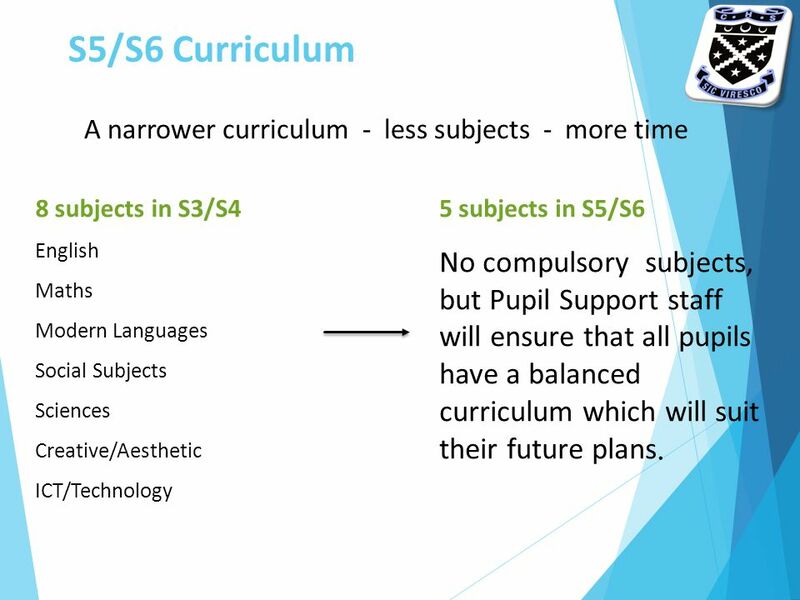 7 S5/S6 Curriculum A narrower curriculum - less subjects - more time 8 subjects in S3/S4 English Maths Modern Languages Social Subjects Sciences Creative/Aesthetic ICT/Technology 5 subjects in S5/S6 No compulsory subjects, but Pupil Support staff will ensure that all pupils have a balanced curriculum which will suit their future plans. 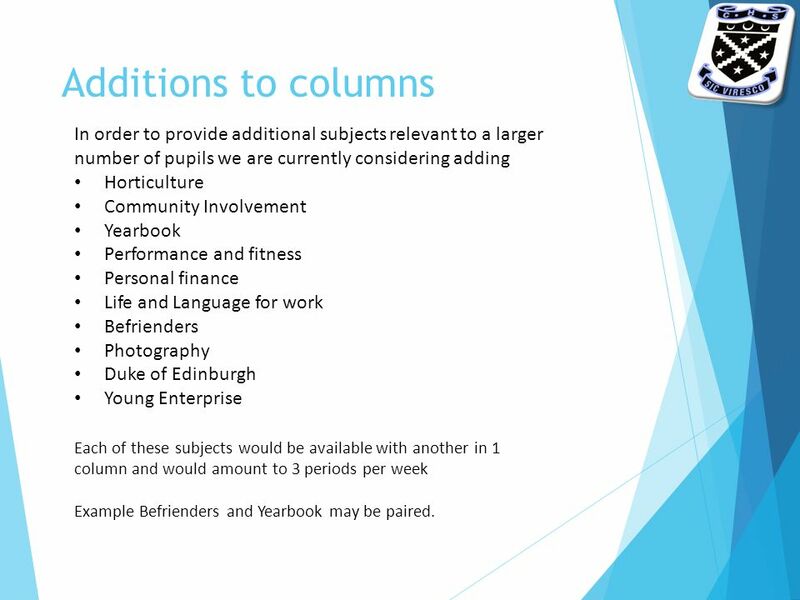 9 Additions to columns In order to provide additional subjects relevant to a larger number of pupils we are currently considering adding Horticulture Community Involvement Yearbook Performance and fitness Personal finance Life and Language for work Befrienders Photography Duke of Edinburgh Young Enterprise Each of these subjects would be available with another in 1 column and would amount to 3 periods per week Example Befrienders and Yearbook may be paired. 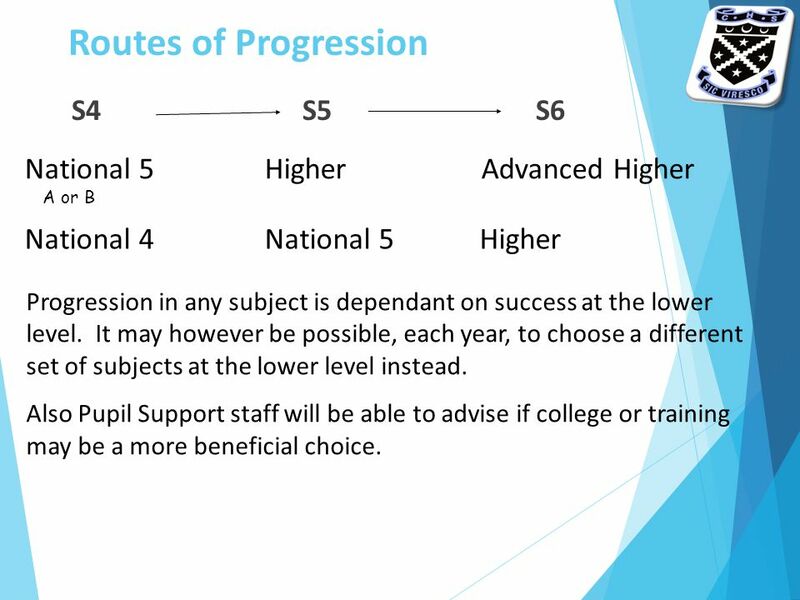 11 Routes of Progression S4 S5 S6 National 5 Higher Advanced Higher A or B National 4 National 5 Higher Progression in any subject is dependant on success at the lower level. It may however be possible, each year, to choose a different set of subjects at the lower level instead. 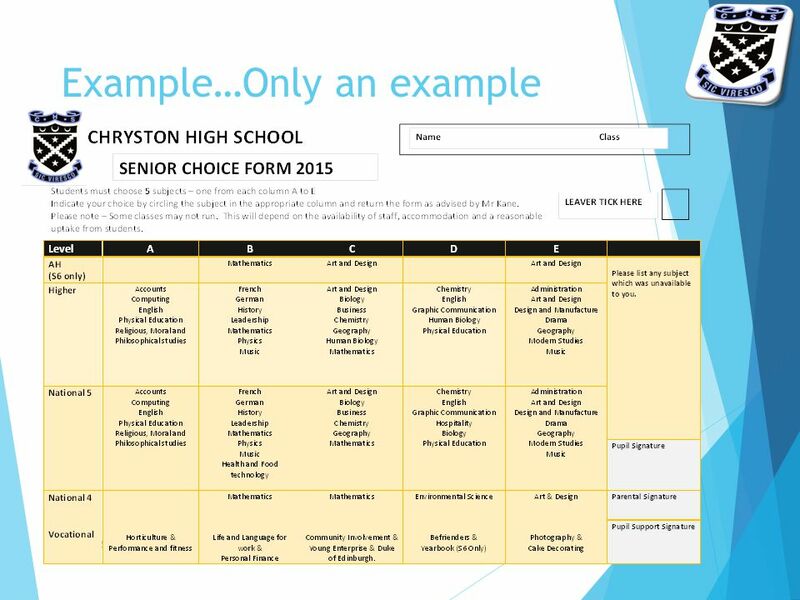 Also Pupil Support staff will be able to advise if college or training may be a more beneficial choice. 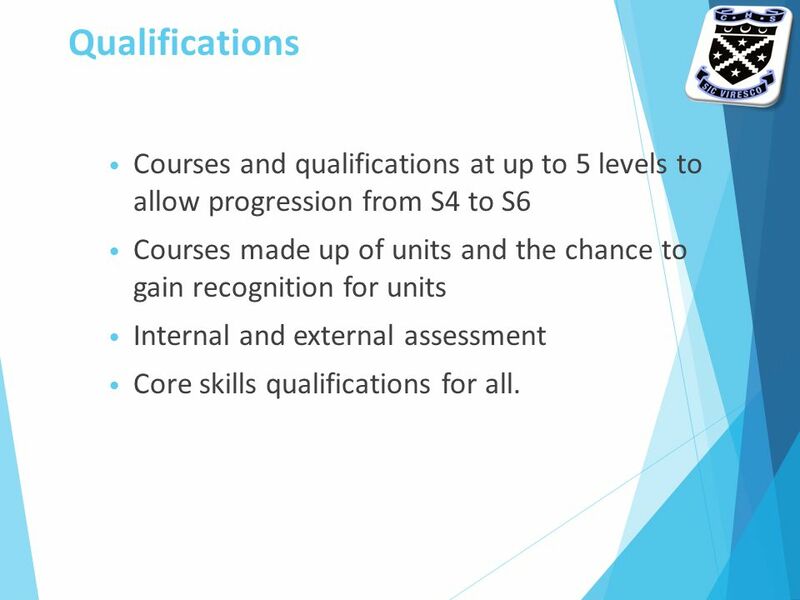 12 Qualifications Courses and qualifications at up to 5 levels to allow progression from S4 to S6 Courses made up of units and the chance to gain recognition for units Internal and external assessment Core skills qualifications for all. 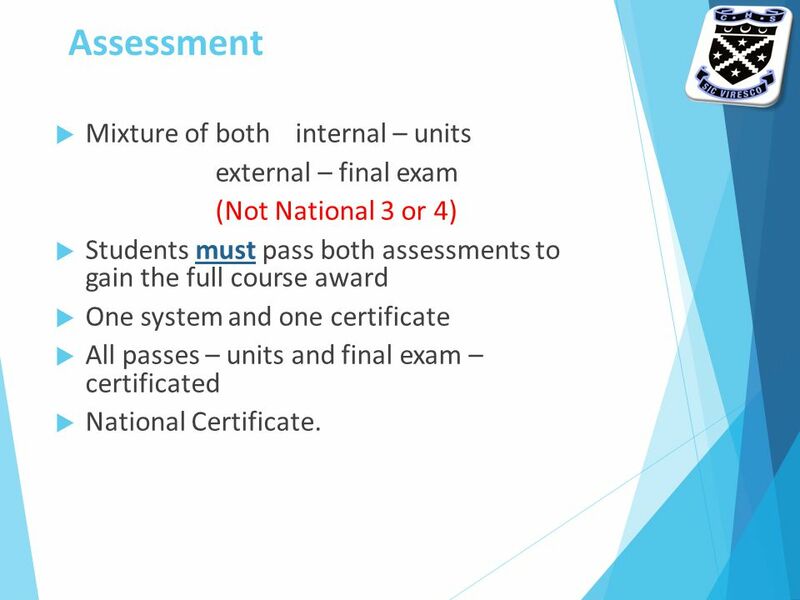 14 Assessment  Mixture of both internal – units external – final exam (Not National 3 or 4)  Students must pass both assessments to gain the full course award  One system and one certificate  All passes – units and final exam – certificated  National Certificate. 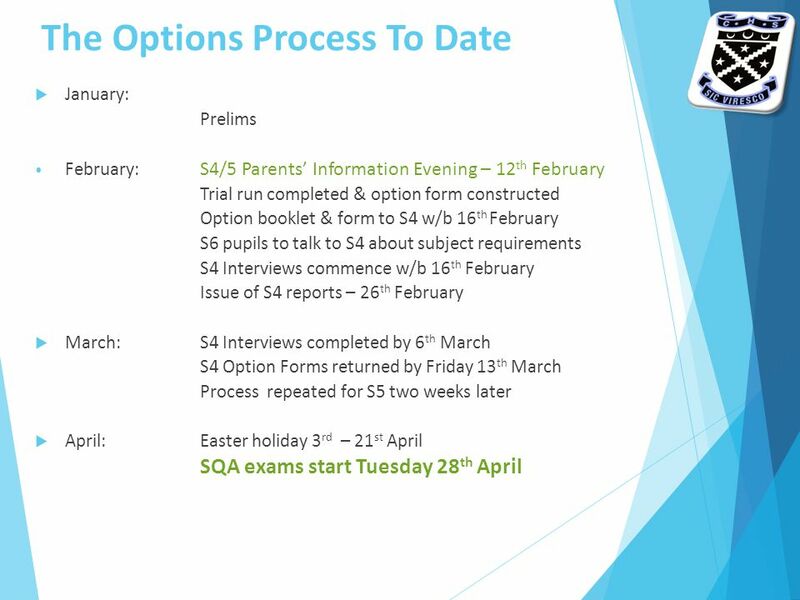 15 The Finishing Touches  Pupil Support staff interview every S4/5 pupil. 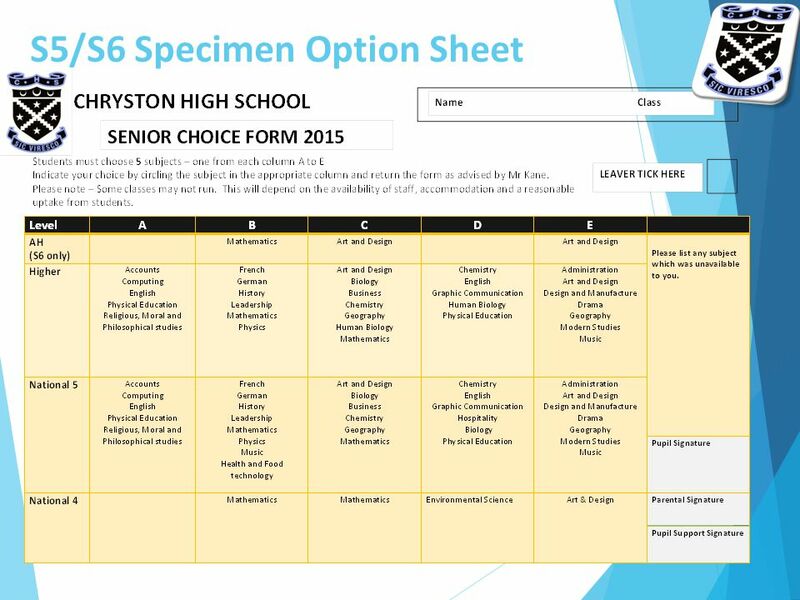  Once option forms are returned, SMT will consider timetable implications (which may restrict some choices).  Note, if forms are returned late, then choices may be limited. 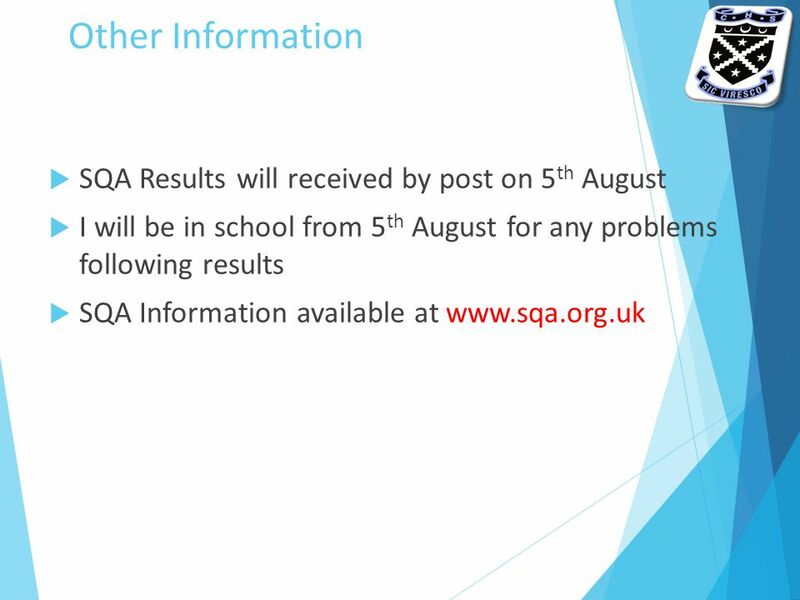  Study leave will end just before the last exam  New courses will start at the beginning of June, so pupils must be in attendance at this time. 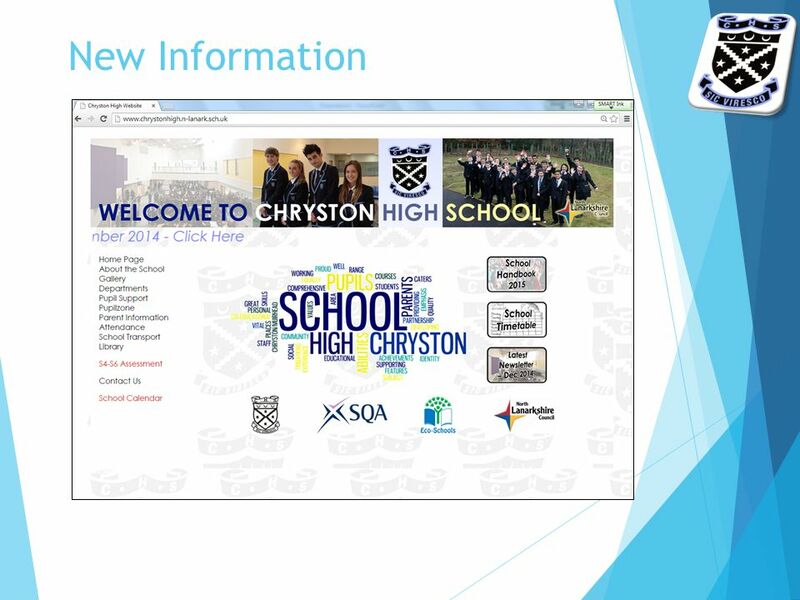 Download ppt "Welcome to Chryston High School SENIOR OPTIONS EVENING." 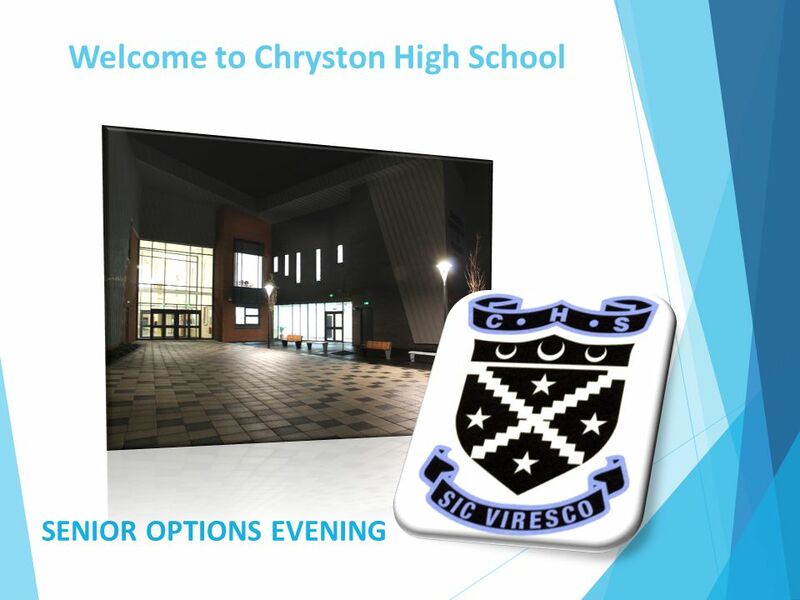 Year 9 Option Information 22 nd January 2014 Welcome everyone. 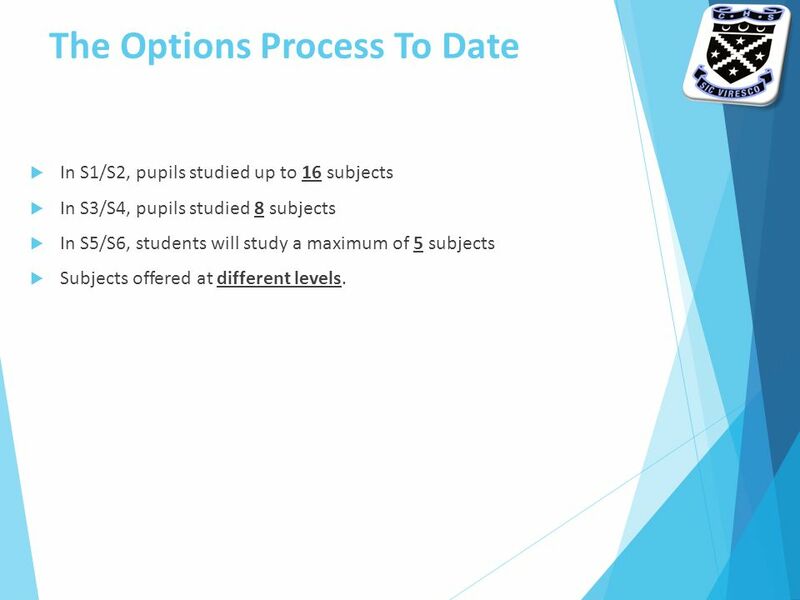 Curriculum for Excellence levels 1&2 in Primary School 3&4 in S1 – S3. 1 Welcome! 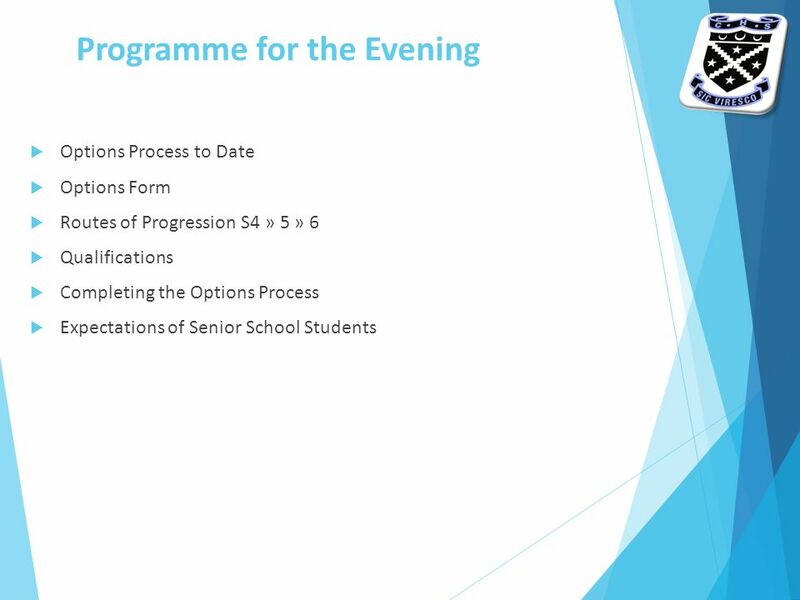 Parents’ Evening – S2 into S3 Course Choices Thursday, 27 th January 2011. St Peter the Apostle High School Parent Council Meeting Curriculum for Excellence Tuesday 19 th February 2013. S2 Choice. Why are we here?  To improve parents understanding of the theory behind “A Curriculum for Excellence”  To improve parents understanding and. Options. 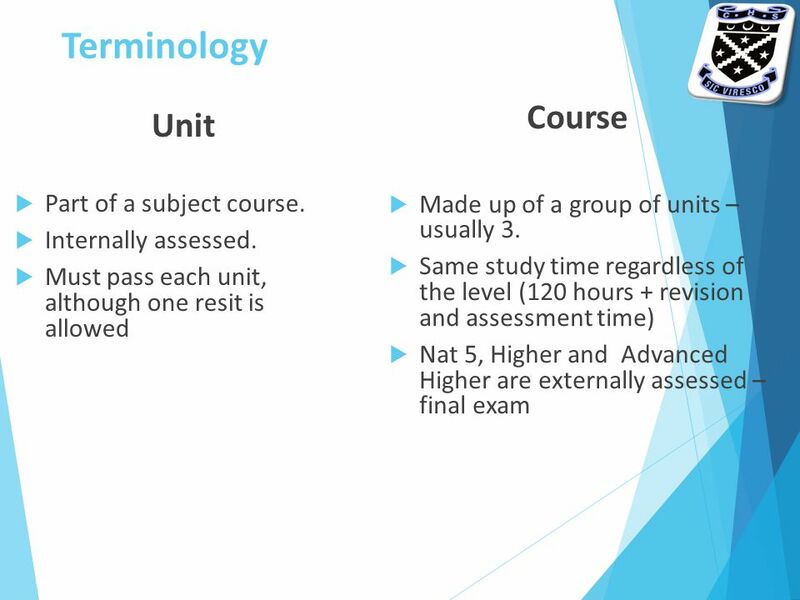 The Core Curriculum Subjects that everyone will do : English & English Literature – 3 hours in Year 10, 4 hours in Year 11 Mathematics – 3 hours.